It's Zafara Day and now you can have Spyr... I mean new colours for Zafaras! I hope they are back to 2 colors at a time now. The outfit is Chef Zafara. OMG I LOVE BOTH OF THESE and it’s extremely rare that I like origami paints! AHAHAHAHAHAHA! The origami's face is like "kill me plz"
Omg, origami is really, really good. I like Polkadot better when it has accent colors. I think the face/belly and spines being a solid color would have helped it read a little clearer. Origami isn't my thing, but I think it's executed a little better- either way, I'm glad to see two colors again! origimi is okay... it's just really goofy looking. and the colors remind me of Barney or some other show for kids/juniors. +1 for Origami, but the eyes are a little weird. If they removed the whites of the eyes, it'd look way better. 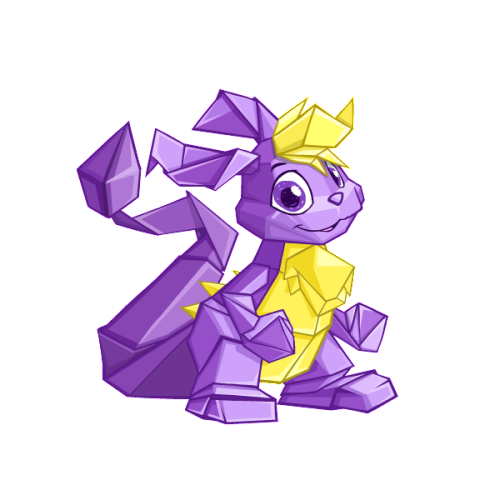 Origami Zafara looks like an origami Spyro to me. That Origami is actually good! I like that it has two colors. Wished for Steampunk or Stealthy. Zafara's my favourite pet, so maybe that is why my expectations are so high. Don't like these colours - Origami is goofy, and Polkadot is just lazy work. There are 16 comments above. Why not post yours?